Russian Medical Fund was a humanitarian organization founded in Vienna, Virginia, to support medical care for children in Saint Petersburg, Russia during the post-Soviet period. Russian Medical Fund provided supplies, equipment, and physician training to the pediatric cardiac unit of Children's Hospital #1 of Saint Petersburg, Russia. The fund provided for a new 7-bed pediatric intensive care unit, purchased a heart-lung machine, and underwrote a complete renovation of the congenital surgery operating suite. In addition, RMF advocated the continuation of U.S. funding for civil society programs there and co-sponsored humanitarian and medical work being done by a related organization, Global Healing. The organization was created as a private foundation in 1996 and continued operations until 2008. The fund was affiliated with the American International Health Alliance. ^ Civil Society International, website, "International Organizations: Health and Medicine"
^ GuideStar, "Russian Medical Fund"
^ Johnson's Russia List, website, 20 February 2006, letter to the editor, "Less Money for Democracy"
^ Global Healing, website, "Contributors"
^ Firedoglake, website, 24 November 2008, "Russian Medical Fund"
^ American International Health Alliance, website, "All AIHA Strategic Partners"
American International Health Alliance, website, "All AIHA Strategic Partners". Cardiac Surgery Department, Children's Hospital Number 1, St. Petersburg, Russia, website. Civil Society International, website, "International Organizations: Health and Medicine". Firedoglake, website, 24 November 2008, "Russian Medical Fund". Global Healing, Berkeley, California, website, "Contributors". GuideStar USA, Partner Report on Russian Medical Fund, EIN number 54-1869946. Harvard Business School Alumni Bulletin, 1 October 2002, p. 49. Johnson's Russia List, website, 20 February 2006, #27 - JRL 2006-43 - JRL Home. King, Sheri, "To Russia, with Love," The Middletown Journal, Middletown, Ohio, 22 September 2001, local news, p. B5. PetersburgCity News, St. Petersburg, Russia, 20 June 2001, City news section, "A new heart surgery room opened in Children's City Hospital No. 1". Schanke, Jerry, "Giving the Gift of Life," Vienna Times, Vienna, Virginia, 16 August 2001, pp. A1, A7. Maine Medical Center is a 637 licensed-bed teaching hospital for Tufts University School of Medicine, and previously Robert Larner College of Medicine, located at 22 Bramhall Street in Portland, Maine, United States with a staff of over 6,000 people. The facility has obtained the rating of Level I Trauma Center, one of only three in Northern New England. Founded in 1874, it is the largest hospital in northern New England with 28,000 inpatient visits, about 500,000 outpatient visits, 88,000 emergency visits, and over 27,000 surgeries performed annually. MMC is structured as a non-profit, private corporation governed by volunteer trustees. Children’s National Health System is a children's hospital in Washington, D.C. Ranked among the top 5 children’s hospitals in the country by U.S. News & World Report, and located just north of the McMillan Reservoir and Howard University, it shares grounds with Washington Hospital Center, National Rehabilitation Hospital, and the DC Veterans Affairs Medical Center. Kurt Newman, M.D., has served as the president and chief executive officer of Children’s National since 2011. Children's National is a not-for-profit institution that performs more than 450,000 visits each year. Featuring 323 beds and a Level IV NICU, Children's National is the regional referral center for pediatric emergency, trauma, cancer, cardiac and critical care as well as neonatology, orthopaedic surgery, neurology and neurosurgery. Children's National is ranked among the best pediatric hospitals in the United States by U.S. News & World Report and The Leapfrog Group. Children's National is a teaching hospital of The George Washington University School of Medicine. Bernard Lown is the original developer of the direct current defibrillator and the cardioverter. Lown developed the direct current defibrillator for cardiac resuscitation and the cardioverter for correcting rapid disordered heart rhythms, and introduced a new use for the drug lidocaine to control heartbeat disturbances. Sharp HealthCare is a not-for-profit integrated regional health care delivery system located in San Diego. Sharp includes four acute-care hospitals, three specialty hospitals, three affiliated medical groups and a health plan. Sharp has approximately 2,600 physicians and more than 18,000 employees. The St. Petersburg I. I. Mechnikov State Medical Academy (SPSMA) is a public university located in St. Petersburg, Russian Federation. The SPSMA is one of the oldest and largest Russian Higher Medical Schools. Over its 100 years of history, the Academy remains a leading institution of Russia in medicine and training specialists in preventive and clinical medicine. It is often called the Second Medical College in St. Petersburg because of its renaming in 1920, relative to Saint Petersburg State Medical University, which is called the First Medical College. The university is currently constructing the largest infectious diseases hospital in Saint Petersburg, a title formerly claimed by the Botkin hospital. Naresh Trehan is an Indian cardiovascular and cardiothoracic surgeon. After graduating from King George Medical College, Lucknow, India, he went on to practice at New York University Medical Center Manhattan USA from 1971 to 1988. He returned to India and started Escorts Heart Institute and Research Centre. He serves as the chairman and managing director and chief cardiac surgeon of MedantaTM-The Medicity. He has served as personal surgeon to the President of India since 1991, has received numerous awards, including the Padma Shri, Padma Bhushan, Lal Bahadur Shastri National Award and Dr. B. C. Roy Award. A hospital is a health care institution providing patient treatment with specialized medical and nursing staff and medical equipment. The best-known type of hospital is the general hospital, which typically has an emergency department to treat urgent health problems ranging from fire and accident victims to a sudden illness. 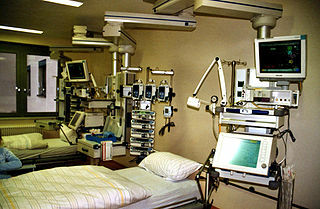 A district hospital typically is the major health care facility in its region, with a large number of beds for intensive care and additional beds for patients who need long-term care. Specialized hospitals include trauma centers, rehabilitation hospitals, children's hospitals, seniors' (geriatric) hospitals, and hospitals for dealing with specific medical needs such as psychiatric treatment and certain disease categories. Specialized hospitals can help reduce health care costs compared to general hospitals. Hospitals are classified as general, specialty, or government depending on the sources of income received. Westchester Medical Center University Hospital (WMC), formerly Grasslands Hospital, is an 895-bed Regional Trauma Center providing health services to residents of the Hudson Valley, northern New Jersey, and southern Connecticut. It is known for having one of the highest case mix index rates of all hospitals in the United States. 652 beds are at the hospital's primary location in Valhalla, while the other 243 beds are at the MidHudson Regional Hospital campus in Poughkeepsie. It is organized as Westchester County Health Care Corporation, and is a New York State public-benefit corporation. Saint Thomas Midtown Hospital, formerly known as Baptist Hospital, is a not-for-profit community hospital in Nashville, Tennessee, United States and the largest such hospital in Middle Tennessee. It is licensed for 683 acute and rehab care beds. The First Pavlov State Medical University of St. Petersburg was established in 1897 in St. Petersburg, Russia, as the first Russian medical college for women. After its 118 years of history, it has become one of the leading medical colleges in Russia and the world. As well as the University is one of the top ten medical schools in Europe. Sanford Health is a non-profit, integrated health care delivery system, with its headquarters in Sioux Falls, South Dakota, with additional offices in Fargo and Bismarck, North Dakota, and Bemidji, Minnesota. UMass Memorial Health Care (UMMHC) is the clinical partner of the University of Massachusetts Medical School and is the largest health care system in Central and Western Massachusetts. UMMHC is a not-for-profit health care network providing all levels of primary to quartary health care.